Where we are and what we do Athelas Exotic Plant Nursery is located in Ninfield, East Sussex, between Bexhill-on-Sea and Eastbourne, and only 30 miles from Brighton. We stock an incredibly large and diverse range of unusual and interesting specimen plants including Palms, Bottlebrush, Bamboo, Bananas, Cannas, Tree Ferns, Olive Trees, Yuccas and Agaves. 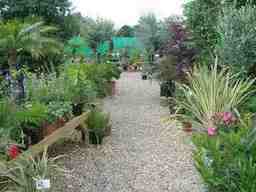 If you are looking for something different to spice up your garden - we are your people! And the best thing is that these plants really are no-fuss, low maintenance plants, great if you have no time, or simply just can't be bothered. Another thing we do is delivery including free local delivery and a planting service. Who we are As you can guess our whole thing is exotic plants. 'Exotic' conjures images of jungles, rainforests and deserts, but we do more than just the wonderful arching palms and juicy determined succulents, we also really like the more ornamental plants too. The kind of things you don't see too often, lots of plants native to Australia, New Zealand, South Africa and the Mediterranean. What we also do, is take a great deal of care in looking after our plants, we like to get to know them, work out what makes them tick and most importantly what makes them happy. So if you pay us a visit, and your most welcome to, you will find a whole bunch of happy vigorous, well looked after plants waiting to greet you. Actually you will also find a happy and reasonably vigorous team, who are happy to advise you, waiting to greet you to. Where we are Other nearby towns to our exotic plant nursery include Rye, Battle, Hastings, Tunbridge Wells and Crowborough. If you don't happen to live in the East Sussex or Kent area, then you can order plants online via our website, as our whole range is available to buy online. We can deliver nationwide and take great care in the packaging of all our plants. As the saying goes 'the proof is in the pudding' so have a look at our testimonials in the link below. If you are in the trade, maybe a designer or a landscaper we offer trade terms and a whole heap of unusual and interesting specimen plants. If you get the chance, pop in and have a look, or give us a call and we will see if we can help.